Assistant Prof essor of Pharmacology Faculty of Nursing, Irbid National University Irbid, Jordan. *Address correspondence and reprints request to: Mohammad Al-Shara, Ph. D Pharmacology, Assistant Prof of Pharmacology Faculty of Nursing, Irbid National University Irbid, Jordan. 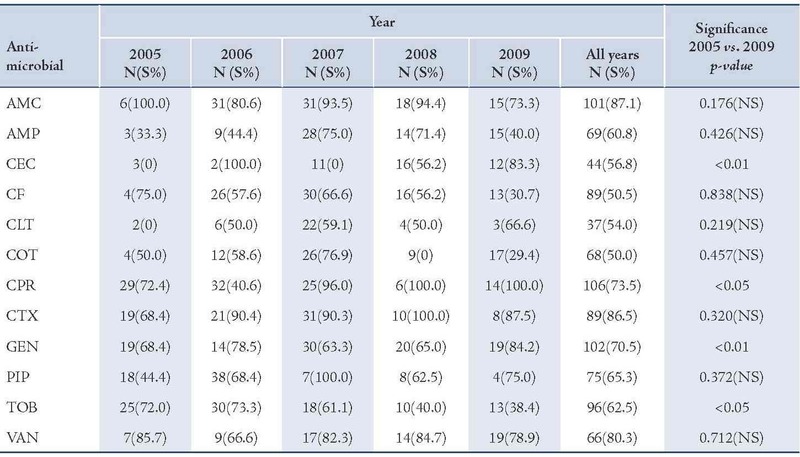 Al-Shara M. A Five-year Review on the Etiology and Antimicrobial Susceptibility Pattern ofOtitis Media Pathogens in Jordanian Children. Oman Med J 2012 Sept; 27(5):358-363. Objective: This study aimed to identify the bacteriological agentsof otitis media in Jordanian children and to assess the in vitro susceptibility of these isolates to commonly used antibiotics. Methods: Retrospective analysis of consecutive samples submitted for microbiological evaluation from outpatients children aged between 6 months and 15 years who were clinically diagnosed with otitis media and were treated at Princess Rahma Hospital in North Jordan between January 2005 and December 2009. Results: A total of 724 isolates were recovered from cultures obtained from 863 children patients giving an isolation rate of 83.8%. The male and female isolate ratio was (1.26:1.0). The most common bacterial species isolated were S. aureus (59.9%) followed by Streptococcus pneumoniae (22.4%), Pseudomonas (7.7%), E .coli (5.9%), Klebsiella spp. (3.1%) and Proteus spp. (0.9%). The most of S. aureus isolates were susceptible to vancomycin (94.0%) and gentamicin (87.3%). Streptococcus organisms were susceptible in highest percentage to amoxicillin-clavulanic acid (87.1%). Gramnegative isolates were highly susceptible to ciprofloxacin (83.5%) and gentamicin (79.8%). Among all isolates, vancomycin was themost effective antimicrobial agent with susceptibility rate of 83.9%, whereas cefixime showed the lowest susceptibility rate of 39.7%. Conclusions: S. aureus isolates were the most frequent bacteria isolated from otitis media and were highly sensitive to vancomycin and gentamicin, while gram-negative isolates were more sensitive tociprofloxacin and gentamicin. Keywords: Otitis media; Antimicrobial; Infection; Bacterial resistance. The rapid emergence of multidrug resistant otitis media in developing countries is a new potential threat to the survival of newborn babies and children.9 There is little information about the etiology and antimicrobial susceptibility pattern of OM available in Jordan. 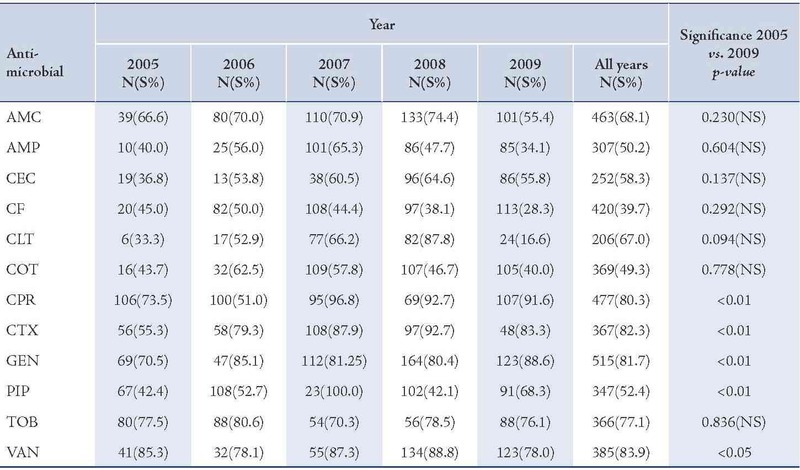 Therefore, this study was conducted to assess the causative organisms and antimicrobials susceptibility pattern of OM pathogens isolated from children during the years of 2005-2009 at Princess Rahma Hospital in Irbid, Jordan. The importance of this study is to aid clinicians to facilitate the empiric treatment and management of children with symptoms of otitis media. Moreover, the data would also help authorities to formulate antibacterial prescription policies. 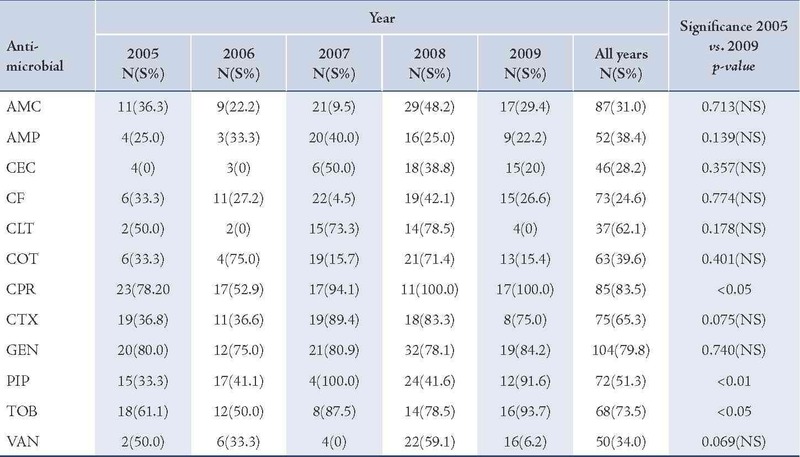 This retrospective study was conducted on 863 outpatient children (6 months to 15 years of age) with clinically diagnosed otitis media with effusion at the Princess Rahma Hospital in Irbid, Jordan between January 2005 and December 2009. Data of microorganisms and antibacterial susceptibility were obtained from the records of Clinical Microbiology Laboratory were filled out on a prepared datasheet. The samples were collected at ENT Department with sterile swab sticks which were properly labeled for each patient. The swab sticks were taken to the Medical Microbiology Laboratory of Princess Rahma Hospital immediately after collection for culture. Specimens were inoculated onto blood, chocolate, and MacConkey agar plates. All plates were incubated for 24 hours aerobically with the exception of chocolate agar that was incubated in a candle jar. Emergent colonies were identified according to standard bacteriological methods.17 All isolates were tested for their susceptibilities to at least 12 out of 15 antimicrobials using antimicrobial diffusion discs.18 Bacterial sensitivity was tested for the following antimicrobials: amoxicillin-clavulanic acid, ampicillin, cefaclor, cefixime, cephalothin, cotrimoxazole, ciprofloxacin, cefotaxime, gentamicin, piperacillin, tobramycin, and vancomycin. Data were analyzed statistically using SPSS (version 15 for Windows) program calculating the frequencies and cross tables. T-test was used to assess the significance of difference between groups of 2005 and 2009. P-value less than 0.05 was considered as statistically significant (S), p-value less than 0.01 as highly significant (HS), p-value more than 0.05 was considered as statistically not significant (NS). The protocol of this study was approved by the Ethics Committee of the Ministry of Health in Jordan (MOH, REC, 08, 0057). Through the five years study period (January 2005 to December 2009), a total of 724 isolates were recovered from cultures obtained from 863 outpatient children with diagnosed otitis media giving an isolation rate of 83.8%. Children were aged between 6 months to 15 years. The male (404) and female (320) isolates ratio was 1.26:1.0. 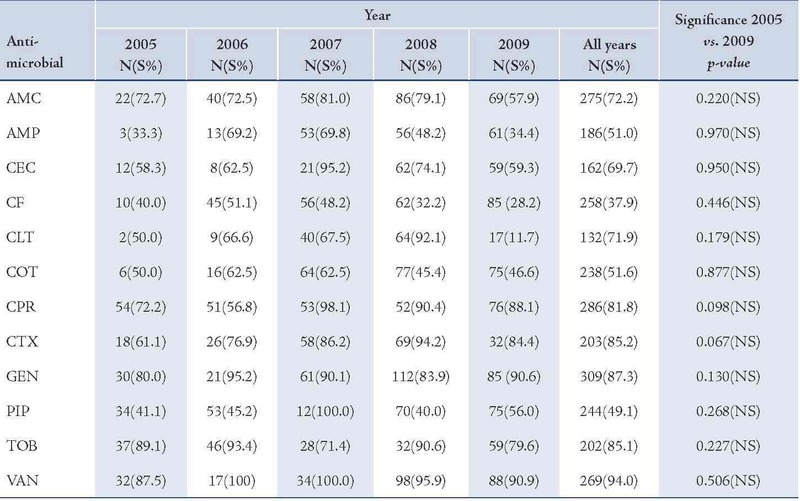 Table 1: Frequency of isolation of causative organisms of otitis media in children. Table 2: Antimicrobial susceptibility among S. aureus organisms to various antimicrobials in children with otitis media. Amoxicillin-clavulanic acid (AMC), ampicillin (AMP), cefaclor (CEC), cefixime (CF), cephalothin (CLT), cotrimoxazole (COT), ciprofloxacin (CPR), cefotaxime (CTX), gentamicin (GEN), piperacillin (PIP), tobramycin (TOB), vancomycin (VAN). Table 3: Antimicrobial susceptibility among Streptococcus organisms to various antimicrobials in children with otitis media. Table 4: Antimicrobial susceptibility among Gram-negative pathogens to various antimicrobials in children with otitis media. Table 5: Antimicrobial susceptibility among otitis media pathogens to various antimicrobials. The incidence rate of otitis media with effusion was higher in males than females, as seen in other studies.5 The pathogens of OM infection S. aureus, S. pneumoniae, E. coli, Klebsiella pneumoniae and Proteus, isolated from outpatient children at the Princess Rahmah hospital were similar to those reported by others.5 S. aureus has been reported to account for being the predominant isolate,10,19,20 and was consistent in this study; however, it was in contrast with other studies that reported S. pneumonia as the predominant agent in children with OM.6,7,9 One significant observation in the isolated species was the gradual increase in the prevalence of isolation of S. aureus organisms. In this study, vancomycin, gentamicin, cefotaxime, tobramycin and ciprofloxacin revealed a higher efficacy against S. aureus isolates compared with other antibacterial agents whereas, cefixime and piperacillin showed the lower efficacy rate, (Fig. 1). A similar finding was reported for susceptibility pattern of S. aureus isolates of OM infection to above antimicrobials.10 In comparison between the year of 2005 and 2009, the results of this study reveal that there were no significant changes in susceptibility rates of OM pathogens for all antimicrobials. 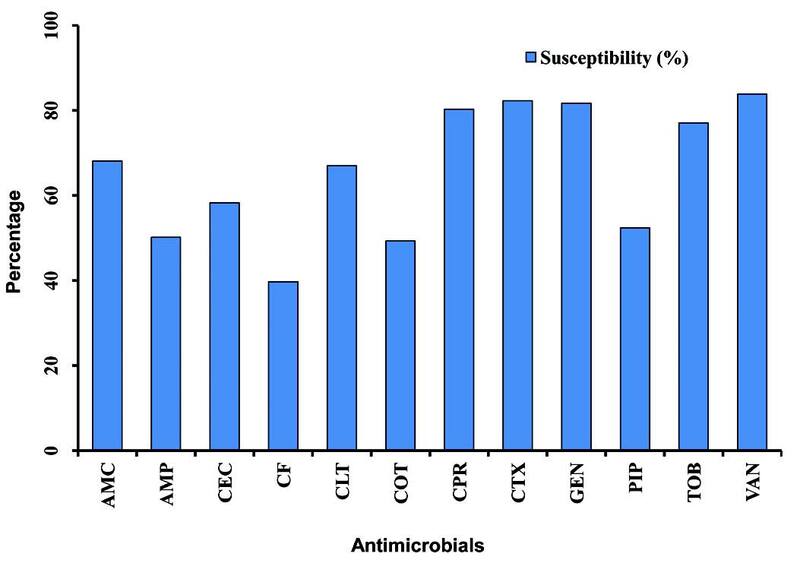 Figure 1: Graphical representation of the mean of susceptibility pattern of S. aureus isolates to various antimicrobials in children with otitis media (2005-2009). Amoxicillin-clavulanic acid (AMC), ampicillin (AMP), cefaclor (CEC), cefixime (CF), cephalothin (CLT), cotrimoxazole (COT), ciprofloxacin (CPR), cefotaxime (CTX), gentamicin (GEN), piperacillin (PIP), tobramycin (TOB), vancomycin (VAN). Susceptibility of S. pneumoniae isolates was significantly increased to cefaclor and gentamicin (p<0.01). The reason for this may be low consumption of these drugs due to unreliability of supplies. On the other hand, the significant declining order in susceptibility of S. pneumoniae isolates for tobramycin may be due to an overuse of this antimicrobial agent.21 Gram-negative isolates showed high susceptibility rate to ciprofloxacin while cefixime showed the lowest efficacy. 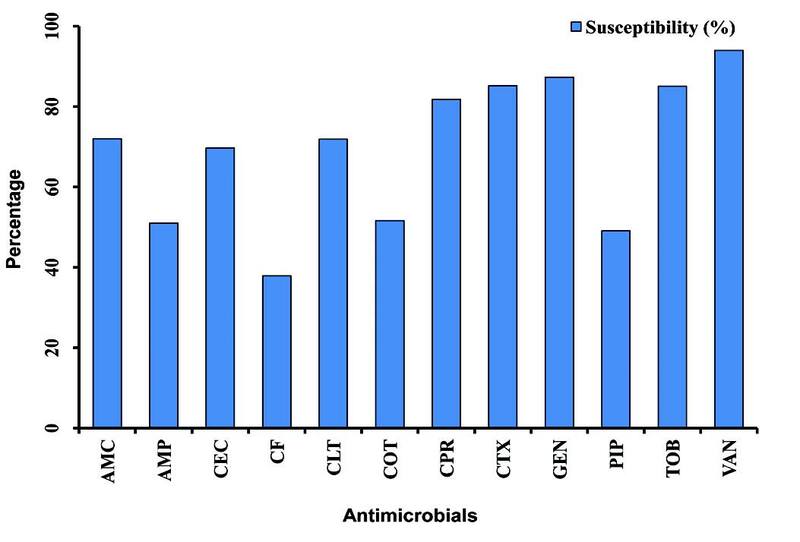 Figure 2: Graphical representation of the mean of antimicrobial susceptibility among otitis media pathogens to various antimicrobials (2005-2009). Amoxicillin-clavulanic acid (AMC), ampicillin (AMP), cefaclor (CEC), cefixime (CF), cephalothin (CLT), cotrimoxazole (COT), ciprofloxacin (CPR), cefotaxime (CTX), gentamicin (GEN), piperacillin (PIP), tobramycin (TOB), vancomycin (VAN). In summary, the results of the present study showed that S. aureus isolates were the most frequent bacteria isolated from otitis media sensitive to vancomycin and cefotaxime, while gram-negative isolates were more sensitive to ciprofloxacin and gentamicin. This emergence of multiple drug resistance calls for judicious antibiotic use to avoid the development of further resistance to available agents for otitis media. It also calls for a continuous monitoring and reviewing of antimicrobial policy in the hospital and the country at large. These results are important for clinicians in order to facilitate the empiric treatment of children with symptoms of otitis media as well as help authorities formulate better antimicrobial prescription policies for better management. The author reported no conflict of interest and no funding was received in this work. 1. Bluestone CD, Klein JO. Otitis media in infants and children, 2nd W.C. Saunders company Philadelphia. 1-3/39- 68/ 73-101/ 145-231, 1995. 2. Chan KH, Swarts JD, Rudoy R, Dever GJ, Mesubed Y. Otitis media in the Republic of Palau. A case-series study. Arch Otolaryngol Head Neck Surg 1993 Apr;119(4):425-428. 3. Daly KA. Epidemiology of otitis media. Otolaryngol Clin North Am 1991 Aug;24(4):775-786. 4. Alho OP, Oja H, Koivu M, Sorri M. Risk factors for chronic otitis media with effusion in infancy. Each acute otitis media episode induces a high but transient risk. Arch Otolaryngol Head Neck Surg 1995 Aug;121(8):839-843. 5. Paradise JL, Rockette HE, Colborn DK, Bernard BS, Smith CG, Kurs-Lasky M, et al. Otitis media in 2253 Pittsburgh-area infants: prevalence and risk factors during the first two years of life. Pediatrics 1997 Mar;99(3):318-333. 6. Kilpi T, Herva E, Kaijalainen T, Syrjänen R, Takala AK. Bacteriology of acute otitis media in a cohort of Finnish children followed for the first two years of life. Pediatr Infect Dis J 2001 Jul;20(7):654-662. 7. Block SL. Causative pathogens, antibiotic resistance and therapeutic considerations in acute otitis media. Pediatr Infect Dis J 1997 Apr;16(4):449-456. 8. Klein J. Otitis media. Clin Infec. Dis. 1994;19:823-833. 9. Jacobs MR, Dagan R, Appelbaum PC, Burch DJ. Prevalence of antimicrobial-resistant pathogens in middle ear fluid: multinational study of 917 children with acute otitis media. Antimicrob Agents Chemother 1998 Mar;42(3):589-595. 10. Ettehad GH, Refahi S, Nemmati A, Pirzadeh A, Daryani A. Microbial and Antimicrobial susceptibility Patterns from patients with chronic otitis media in Ardebil. Int J Trop Med 2006;1:62-65. 11. Poole MD. Otitis media complications and treatment failures: implications of pneumococcal resistance. Pediatr Infect Dis J 1995 Apr;14(4)(Suppl):S23-S26. 12. van Kempen MJ, Vaneechoutte M, Claeys G, Verschraegen GL, Vermeiren J, Dhooge IJ. Antibiotic susceptibility of acute otitis media pathogens in otitis-prone Belgian children. Eur J Pediatr 2004 Sep;163(9):524-529. 13. Sahm DF, Jones ME, Hickey ML, Diakun DR, Mani SV, Thornsberry C. Resistance surveillance of Streptococcus pneumoniae, Haemophilus influenzae and Moraxella catarrhalis isolated in Asia and Europe, 1997-1998. J Antimicrob Chemother 2000 Apr;45(4):457-466. 14. Osazuwa F, Osazuwa E, Osime C, Igharo EA, Imade PE, Lofor P, et al. Etiologic agents of otitis media in Benin city, Nigeria. N Am J Med Sci 2011 Feb;3(2):95-98. 15. Ettehad l. Refahi S, Nemmatil A, Pirzadeh A, Daryani A. Microbial and antimicrobial susceptibility patterns from patients with chronic otitis media in Ardebil. Int. J Trop Med 2006;1:62-65. 16. Friedland IR, McCracken GH Jr. Management of infections caused by antibiotic-resistant Streptococcus pneumoniae. N Engl J Med 1994 Aug;331(6):377-382. 17. Cowan ST, Steel KJ. Manual for the Identification of Medical Bacteria. 2nd ed. Cambridge University press, Cambridge, 1974. 18. Bauer AW, Kirby WM, Sherris JC, Turck M. Antibiotic susceptibility testing by a standardized simple disc method. Am J Clin Pathol 1960;45:493. 19. Brownlee RE, Hulka GF, Prazma J, Pillsbury HC III. Ciprofloxacin. Use as a topical otic preparation. Arch Otolaryngol Head Neck Surg 1992 Apr;118(4):392-396. 20. Campos MA, Arias A, Rodriguez C, Dorta A, Betancor L, Lopez-Aguado D, et al. Etiology and therapy of chronic suppurative otitis. J Chemother 1995 Oct;7(5):427-431. 21. Bluestone CD, Stephenson JS, Martin LM. Ten-year review of otitis media pathogens. Pediatr Infect Dis J 1992 Aug;11(8)(Suppl):S7-S11. 22. Al-Shara M. Etiology and Antimicrobial Susceptibility Pattern of Otitis Media in Children at Princess Rhamah Hospital in Jordan. NIJM 2010;6:74-78.